Saroj Khan was the one who bring a change in choreography to Indian Cinema. She has choreographed lot of songs with the Bollywood Diva Madhuri Dixit. 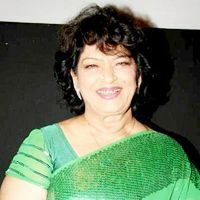 Check out the most updated and latest information about Saroj Khan's on the Internet.We have 65 videos of Saroj Khan including interviews, events, or public appearances.Saroj Khan has over 15 Fans registered on India-Forums.com. We have 80 Bollywood News articles related to Saroj Khan.Do share your criticism, comments and feedback for the Actor on Saroj Khan's comments page. We have over 6 Photos of Saroj Khan to view and download including Saroj Khan's Wallpapers. heyy saroj khan i need your address to sedn you aletter.i want take permission from you if i can learn dance step from you. i wish mai bhi kabhi app ko mil pati, i like your smile, and deep eyes. please keep one rupee for me also of your blessings. baby from england.